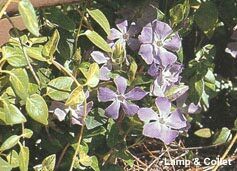 Growth Habit: Blue periwinkle has smooth, dark oval shaped leaves. It was once a popular garden plant, however its vigorous spreading habit and strong competition it provides against other plants leads to most people regarding it as a serious weed. Type of plant: A scrambling, low growing perennial, with long trailing stems which may root at the nodes. Flowers: Attractive bluish-purple, five petalled flowers. Seeds: Fertile seed is rarely (if ever) produced as most infestations consist only of female plants. Dispersal: Plants spread by the stems producing new roots at the nodes, from where new plants arise. Distribution: Widespread garden escape on roadsides and waste places, cemeteries and abandoned house blocks. It is also a significant bushland invader in damp forests. Can dominate the understorey and exclude native species. Often escapes gardens onto adjoining properties. Cutting (all year). Repeated cutting and mowing before seeding will help control it. Herbicide (spring, summer and autumn). Glyphosate is registered for use in Tasmania. Repeated applications may be necessary. Grubbing. Suitable for small controllable areas. After removing as much of the plant as possible cover the area with newspaper and mulch heavily.